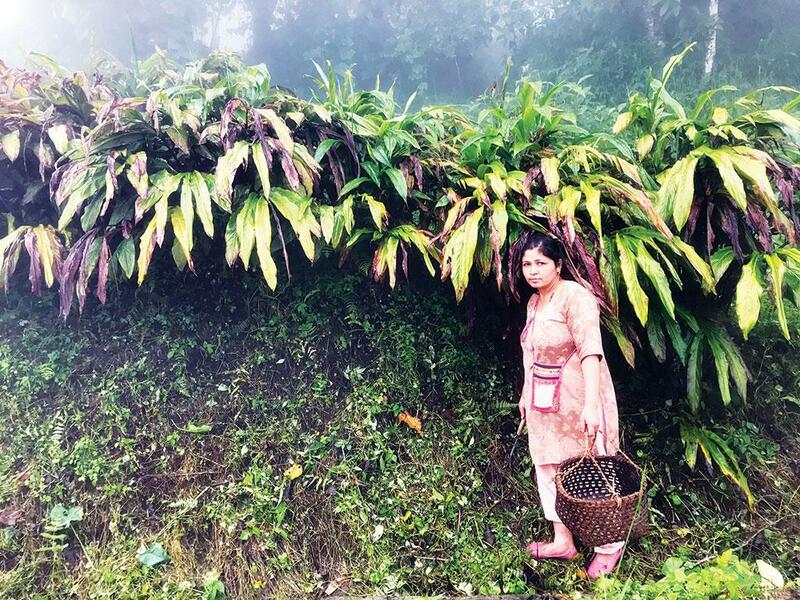 Sikkim, once the world's largest producer of large cardamom, is trying to regain its lost glory. Can it achieve the feat in the face of a changing climate? AT 92, Til Bahadur Chhetri is a living witness of the rise and fall of large cardamom in Sikkim. Prized for its complex aroma, the exotic spice Amomum subulatum is grown across the eastern Himalayan region, including Sikkim and the Darjeeling hills in India. “Till the late 1990s, I used to get 40 sacks (about 2,000 kg) of dry large cardamom a year from my 7.2-hectare (ha) land. After that production started to decline,” says Bahadur, a resident of Hee Patal village in West Sikkim district. “Though it has improved in recent years, all I get now is a measly 300 kg,” he laments. In neighbouring Hee Martam village, Ganesh Chhetri, a young farmer, recounts a similar tale. “Just 10 years ago, my 2 ha land used to yield 300 kg of cardamom. It is now down to 100 kg,” says Ganesh, adding that the decline has forced farmers to shift to less lucrative crops like corn, vegetables and fodder. The trend is evident across the Northeastern state, which till 2003-2004 was regarded as the world’s largest producer of large cardamom. Though it continues to be the largest producer of large cardamom in India, the title of the world’s leading producer now rests with neighbouring Himalayan country, Nepal, which caters to about 68 per cent of the global market share of the spice. A 2014 working paper by the International Centre for Integrated Mountain Development (ICIMOD), an intergovernmental learning and knowledge sharing centre based in Nepal, shows that the area under large cardamom in Sikkim increased from 19,912 ha to 22,714 ha between 1999 and 2004. That year, the state saw a record production of 5,152 tonnes of cardamom, up from 3,710 tonnes five years ago (see ‘Falling out of favour’). But since 2004-2005, the area under large cardamom has registered a decline, says Bharat Gudade, a scientist at the Gangtok-based regional research station of the Indian Carda mom Research Institute that functions under the Ministry of Commerce and Industry. Though production has shown signs of improvement following 2011-2012, only 17,735 ha was under cultivation in 2017-2018 producing over 4,385 tonnes of large cardamom. “We are working closely with agricultural extension agencies and farmers to reverse the declining trend,” says Gudade, adding that the perennial crop is an important source of cash income to Sikkim farmers. ICIMOD study shows that the spice contributed US $500-1,700 to a house- hold’s annual income in 2014. Farmers and agriculture experts attribute the decline to several factors, including diseases and pests, old plantations, poor management, unavailability of good quality planting material and lack of irrigation facilities. “Viral diseases, such as chirke (mosaic streak) and foorkey (bushy dwarf), are major threats to the crop. Once infected by chirke, the leaves turn yellow and the plant withers. In foorkey disease, the flowers do not grow into capsules,” informs Bahadur, adding that the diseases were unheard of in the region some 15 years ago. But several scientists say the state is losing the spice to climate change. Large cardamom thrives in cold-humid conditions under shades of trees, preferably the Himalayan alder (Alnus nepalensis), between 600 and 2,400 metres above the sea level. Since the plantations require a high level of humidity (over 90 per cent) and soil moisture of more than 70 per cent, they are best suited to areas that receive annual rainfall of 2,000-4,000 mm and an ambient air temperature of 10-22ºC. Ghanashyam Sharma, co-author of the ICIMOD’s 2014 working paper who heads non-profit The Mountain Institute India in Gangtok, says winter rains are important for the crop as that’s the time the perennial plant produces new shoots. Rains are also required during March and April when the base of their stems becomes adorned with yellow flowers. “But, our winters have become extremely dry and warmer. A lack of irrigation system adds to the farmers’ woes,” he says, adding that long dry spells and disease infestations in recent years are largely responsible for the dwindling yields of the crop. Two decades ago, several areas in the state, such as Namchi in South Sikkim district, had huge cardamom plantations at just 1,200 metres above the sea level, says Kailash S Gaira, scientist with the G B Pant National Institute of Himalayan Environme ntal and Sustainable Development, Gangtok. Due to the rise in temperatures in recent years and reduced winter precipitation, farmers are finding higher altitude lands to grow large cardamom, Gaira says. These climatic changes have been well documented in the state government’s 2012 report, “Climate Change in Sikkim: Patterns, Impacts and Initiatives”. Over the last two decades (from 1991-2000 to 2001-2010), annual rainfall at the Tadong meteorological station has decreased at the rate of 17.77 mm a year; mean minimum temperature has increased by 1.95oC between 1981 and 2010, the report notes. Farmers and scientists link the recent spurt in diseases, such as chirke and foorkey, to this rising temperature and reduced rainfall. Gaira cites another reason for the declining production of large cardamom in Sikkim. Studies show that changes in local weather conditions affect the population of bumblebees, which is the primary pollinator of the exotic spice, he adds. Ram Kumar Bhandari is a young farmer from Hee Bazar village, located about 10 km from Hee Patal in West Sikkim. While most farmers in the state are abandoning large cardamom, Bhandari says the yield from his plantations is on the rise. And, the credit for this rests with the traditional wisdom and scientific farming and irrigation practices he has adopted in his farm. Bhandari grows the seremna variety of large cardamom which is native to West Sikkim. 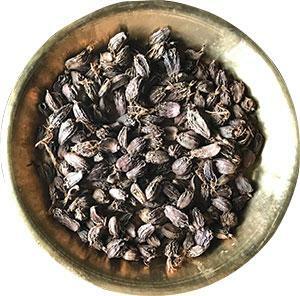 Santabir Subba, an octogenarian from neighbouring Hee Gaon, says the variety was, in fact, discovered in 1985-86 by a farmer from the region, Sukram Limboo. Today, the variety is grown across the northeastern Himalayan region for its big-size capsules fetch a premium price in the market. Bhandari, whose family traditionally grew paddy and corn, started growing the variety on 2.8 ha of his farmland just a couple of years ago. “The variety grows well on virgin, fertile soil. Since our land had never been under cardamom before, we harvest an impressive 700 kg a year,” Bhandari informs. Seremna’s short life cycle—unlike most perennial varieties, seremna yields only for four years—also allows Bhandari to follow healthy farming practices like crop rotation. After growing large cardamom for four years, he plans to uproot the entire plantation next year, and grow corn and paddy for two years before returning to seremna. “I also grow legumes and fruits along with large cardamom. All these ensure that the land remains fertile and nature’s balance is maintained,” he says, adding that one of the reasons production of the spice has reduced in Sikkim is that most farmers have been growing it on the same land for several decades. Ganesh says in his village Hee Martam almost 90 per cent of the farmers are growing seremna for two reasons. First, its not-so-thick capsules are easy to cure and fetch better price; and second, the variety allows crop rotation, which is now being seen as the only way to improve large cardamom yields in West Sikkim. To deal with erratic rainfall, farmers have put in place decentralised systems of irrigation. “On an average, a large cardamom plant needs 64 litres of water during the months of February, March and April to aid in panicles initiation and formation of fruits,” says Bhandari. He uses plastic pipes to bring water from a nearby jhora (perennial stream) to his plantation and has insta lled sprinklers across his farm to water the plants. In several villages, farmers have also dug pits to harvest rainwater. These pits recharge the aquifers and local springs, called khola, and help maintain soil moisture, which is important for the crop. If the rains give a miss to the region, farmers transfer the water to their farms using poly pipes and sprinklers. Ganesh says farmers are also using mulches—dry leaves or grass and cow dung applied at the base of the plant—to maintain soil moisture and fertility. To keep the plantations healthy and disease-free, Bahadur suggests following the traditional practice of burning the stubble. Now, due to lack of time and non-availability of farm labourers, most leave the stubble in the farms that could be responsible for the spread of the diseases, he says.Gudade says his institute is training farmers to select healthy non-diseased plants and not to overcrowd the farm. “Most farmers grow 10,000-15,000 plants in a hectare, which is an unhea lthy practice. We recommend growing not more than 4,000 plants per hectare for a good yield,” he says. The story is being published as part of Indian Himalayas Climate Adaptation Programme-Centre for Media Studies fellowship programme.